The British Music Collection – clean, shiny and accessible! This month our fantastic team of student helpers have completed a huge sorting and repackaging project that has brought together all of the scores held within the British Music Collection for the first time in the Collection’s history! This is a fantastic achievement that has been 48 years in the making! To celebrate this fact, here’s the history (with a few photos ) of the British Music Information Centre, the organisation that founded the Collection in 1967. The British Music Information Centre (BMIC) was founded in 1967 by the Composers’ Guild of Great Britain within the Guild’s central London office of 10 Stratford Place, which was also the home of The Royal Society of Musicians. The Centre was formally opened by Lord Goodman on 7 November 1967 and was established with the assistance of the Calouste Gulbenkian Foundation, the Arts Council, and the Performing Right Society. The BMIC was founded as a charity and its work was dependent on grants and the external financial support that it received. Founded at a time when national Music Information Centres were rising in popularity (following the formation of the first Centre in the USA in 1939), the BMIC was established as a drop-in centre where users could go to see and hear 20th century British classical music, and to research contemporary composers and their works. The primary function of the Centre was to act as a voluntary library of deposit where composers and publishers of 20th century British classical music could deposit scores and recordings of their work, which allowed would-be performers access to these works to study and play. All works were acquired by donation, and the collection was initially just restricted to the work of members of the Composers’ Guild, and later BASCA (British Academy of Songwriters, Composers and Authors) concert music members; this restriction was later removed. The Centre defined ‘British’ music as being composed by an individual born or living in the UK. The initial core of collection was founded on the deposit of The British Council’s sheet music collection in 1967, which included material dating back to 1900. 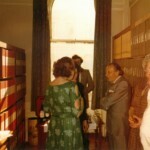 By 1969 the Centre already held 8000 scores of both published and unpublished works, as well as tapes and reference material for consultation and study. Although initially some publishers were opposed to the Centre because they believed it posed a threat of competition, over the years the BMIC gradually became accepted by more and more publishers and the Centre began to accumulate increasing amounts of published material. This made the library the only permanent collection of both published and unpublished contemporary British music and it significantly contributed to the growth of the collection in both size and diversity throughout the 1970s and 1980s. By the 1990s the acquisition policy of the BMIC stipulated that eligible works included: work that is published by a major publisher (e.g. Boosey & Hawkes, Faber Music, Chester Music); unpublished work by professional composers of significant standing (e.g. frequently commissioned or performed by leading orchestras); work by full members of a leading professional body (e.g. BASCA, including shortlisted works for British Composer Awards); work commissioned by the BMIC as part of its projects and professional development programmes (e.g. Adopt a Composer, Embedded…); and work commissioned or funded by leading commissioners or funders (e.g. BBC, Arts Council England, PRS for Music Foundation). The Centre was aware that subjectivity influenced these criteria but in practice any disputes over inclusion/exclusion were resolved by the Director of the BMIC or by reference to the composers on the BMIC Board. Recordings started to enter the collection during the 1970s, firstly on reel to reel tapes and vinyl records, and later on audio cassettes and CDs. The recordings in the collection included both published and private recordings donated by publishers and composers, recordings of concerts and events that took place at the BMIC and the Society for the Promotion of New Music (SPNM), and recordings of BBC Radio 3 broadcasts. A joint project with EMAS (Electro-Acoustic Music Association) in the early 1980s resulted in the Centre starting to acquire recordings of British electro-acoustic music, while during the mid-1980s the BMIC’s reel to reel tape recordings were transferred to Betamax tapes during a migration project funded by the British Library. By 1885 over 6000 people a year visited the BMIC, with even more users contacting the Centre remotely by letter and telephone. In addition to the Centre’s primary role as a contemporary music library, the BMIC also ran numerous projects, events and performances in order to promote contemporary British music. 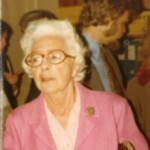 By 1985 over 80 events were being held annually, with performers including Michael Finnissy, Jane Manning and John McCabe, and premiers of work including music by Peter Maxwell Davies, Judith Weir, Michael Finnissy and Chris Dench. Some performances were also preceeded by talks. The BMIC’s Salon series of concerts ran for 30 years until 2003 with an emphasis on programming first performances, experimental music and neglected early-mid 20th century repertoire. From the 1980s onwards, the BMIC’s rising profile and increasing number of projects resulted in the Centre working more collaboratively with other organisations to promote contemporary British music, particularly SPNM, EMAS and The Place Dance Services (TPDS). In 1999 the BMIC established The Cutting Edge, which was an annual thirteen-week concert series held in the autumn. The Cutting Edge series, based mostly at The Warehouse, Waterloo, aimed to put contemporary music from the UK in an international context, and from 2001, each series was followed by The Cutting Edge Tour that took place May-December of the following year. The Cutting Edge Tour showcased up to 20 concerts taken from the previous year’s London series at locations across the UK, along with workshops and learning events. Also in 1999 the BMIC established the New Voices and Contemporary Voices composer support schemes. These schemes provided print, distribution and promotion services for composers at both the beginning and middle of their careers, and intended to fill the gap for composers who were looking to publish independently. From the late 1990s onwards, with increasing pressure on finances and the rising costs of housing the collection in central London, the staff and Board began looking at alternate locations and organisational structures to manage the Centre. In 2004 Arts Council England (ACE) instigated a proposal to create a new higher profile body for the new music sector from the merger of a number of music organisations that received funding from ACE, including the BMIC. The original idea to merge a number of music organisations into one larger body had been discussed within the sector since the 1980s but ACE initiated the 2004 project for two main reasons; firstly ACE identified the opportunity to have shared facilities within in a new building in central London (King’s Place, near King’s Cross), and secondly ACE was looking to redress the role of the Contemporary Music Network within ACE. Initially ten organisations were approached about the merger, including the African and Caribbean Music Circuit, British Music Information Centre, Contemporary Music Making for Amateurs (CoMA), Contemporary Music Network, Jazz Services, the Society for the Promotion of New Music and The Sonic Arts Network. This project, initially called The Kings Place Initiative and later The New Organisation (TNO) Project, resulted in the creation of Sound and Music from the merger of the British Music Information Centre, Contemporary Music Network, the Society for the Promotion of New Music and The Sonic Arts Network in 2008. Upon creation, Sound and Music was temporarily located in British Music House, 26 Berners Street, London, before it moved to its current location of Somerset House, The Strand. Throughout the course of the reorganisation project both the BMIC’s collection and the financial burden of accommodating it continued to increase. The limited space and financial constraints meant that in 2002 sections of the collection had to be moved to alternate premises. Works by composers who had died before 1960 were moved to the Royal College of Music (RCM) Library, and works written before 1960 by composers who had died between 1960 and 2002 were moved to a storage facility belonging to the Performing Right Society (PRS). The material sent to the Royal College of Music Library could be accessed by researchers on site, whereas there was no public access to the PRS’s storage facility and this material could only be consulted through prior arrangement with the BMIC. In 2004 the financial pressures meant that the BMIC moved premises from 10 Stratford Place to Lincoln House, 75 Westminster Bridge Road, London. In 2007 the BMIC could no longer afford to house the collection in central London and so it was sent to a storage facility in Southend. 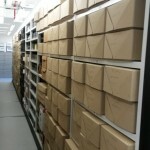 This is where the collection remained until it was transferred, along with the RCM and PRS material, to the University of Huddersfield Archives in 2010. 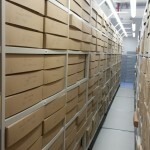 The collection then moved into the University’s new state-of-the-art archive facilities at Heritage Quay in 2014. With all sections of the British Music Collection now fully catalogued, reintegrated and repackaged into archival-quality materials, the collection has never been more accessible and safeguarded for the future, so what are you waiting for! The catalogue for the Collection can be found here, and all the details that you need to know about how to visit the Collection can be found here. Enjoy! The Heritage Quay Listening Room is now open for researchers to explore over 90 years of music and sounds recordings from the archive! Music forms one of the most important strengths of the Heritage Quay collections and this is reflected by the sheer volume of audio recordings found within the archive. The British Music Collection itself contains over 21,000 individual recordings of 20th and 21st century British classical/art music, and the archive also holds extensive collections of sound recordings that relate to viol music, jazz, and the Huddersfield Contemporary Music Festival hcmf//. The volume and diversity of the recordings is also reflected by the variety of different audio formats that the recordings are stored on. The Heritage Quay Listening Room has been equipped with a range of professional playback and digitisation equipment to enable the long term access of these vital records into the future, regardless of format. Access to the audio and written records of a collection allows us to get even closer to the subject; not just seeing/touching history but hearing it too! The Listening Room is open to researchers during search room opening hours. Details about visiting the service can be found here. Sadly the picture below doesn’t capture the excitement with which I unwrapped this latest addition to our service! As part of the fantastic new facilities in Heritage Quay we will have a dedicated Listening Room that will allow us to make thousands of archival audio recordings fully accessible to our users for the first time. With a turntable and specialised PC (with a digital audio workstation) our users will be able to listen to vinyl and digital archival recordings to their heart’s content. Meanwhile the significance of this tape deck reflects the fact that a large proportion of our audio recordings are currently stored on obsolete cassette formats that place these unique audio records at significant risk. Good quality playing equipment for such formats is becoming increasingly difficult to source and the fragile nature of cassette tape increases the risk of damage and the loss of these vital records for future generations. In response to this, our listening room will be equipped with archival quality digitisation equipment that will allow us to migrate these records onto much safer and more stable formats, thereby ensuring their continued access into the future (when subject to our professional collections management procedures obviously!). However the value of undertaking this digitisation work is not just limited to the improved preservation of the recordings. Migrating these records to digital formats will allow us to increase access to them and enable our users to engage with them in far greater and more diverse ways. Plans are being devised as I speak, but I’m sure they’ll be involving our exploration space and the big curvy screen, not forgetting our Participation and Engagement Officer of course! Here in the archives we work hard to give all the records the best possibly chance of survival in the future. We repackage into acid-free boxes, follow careful handling guidelines – and even wear the white gloves so beloved by television historians from time to time! This week we’ve been working with the Rugby League, whose collection is deposited here at the University Archives, to provide advice on handling and packaging a collection that they have recently purchased as part of their heritage work. As the Rugby League’s new collection includes a lot of shirts (so fans of heritage shirts should watch this space for news of exhibitions!) we spent some time developing a packaging system which would follow good practice guidelines for packaging textiles, but also allow the shirts to fit in the collection’s standard boxes. After a little experimentation we came up with a method which is reasonably straightforward to carry out, using acid-free tissue and a series of folds that ensure that a layer of tissue is placed between all of the folds in the shirt. We then created a step by step photo guide to allow the heritage project assistant to carry out the repackaging unsupervised. With the launch of Heritage Quay just months away, we are currently very busily planning of the move of our collections from their existing (and inadequate) accommodation, to the brand new facilities of Heritage Quay that will meet national and international archival standards. And though, as you might imagine, lots of the preparatory work involved in this planning process consists of creating detailed lists of collections’ locations, a just as important element that I am currently engaged in is the preservation and repackaging of collections prior to the move. On this subject we might sound like a broken record, but the importance of ensuring that archival records are kept in the best possible conditions really cannot be underestimated, and this is one of the most important reasons behind our current HLF project. As archivists we are in the very strange position that our primary objective of ensuring that our collections will last forever(!) is probably an impossible task when thought of in terms of such an infinite timescale! However when we talk about the timescales for preserving our collections, most archive professionals prefer to use the term ‘in perpetuity’, which we take to mean that we pass our collections onto our successors in the best possible condition, so that they are able to do the same. Seen from this perspective, some of our more mundane and relatively simple tasks, such as cleaning records, removing them from dirty/decaying containers and repackaging them in acid-free archival quality materials, take on a far greater significance. Also the importance of accurately labelling and numbering records during this process cannot be underestimated, because an archival record being irretrievable poses just as big a risk to the vital information that it contains as the physical deterioration of the record itself. Repackaged British Music Collection box, all neat and shiny – so satisfying! And so these are the positive thoughts that keep us motivated as we work our way through the never-ending but vital re-packaging, re-boxing and numbering work in preparation for the big move! Not long to go now…. and so much to do! If you happened to be walking past the library seminar room last Monday and wondered if you were witnessing preparations to combat the Viking apocalypse Ragnarok, predicted to take place this Saturday, never fear, it was just the latest batch of Archive volunteers getting to grips with some archives in need of some basic preservation! Whilst we keep archive collections in special repositories where temperature and humidity are controlled, we often inherit collections that have been ‘in storage’ with their creators. Think about where your office or family keep their papers. Attics, cellars, offsite storage. In archives we’ve seen it all, and it usually comes complete with damp, pest damage and copious amounts of dust!! Little Britain might encourage it as an appetiser, but dust is certainly no good for your health. Many of the old Huddersfield Technical College student registers have spent decades in storage before coming to the archive, and the folders were covered with a thick layer of the stuff. Our current batch of volunteers come from the History, Politics and the English department and some are volunteering as part of their course, others to see if a career in Archives might be for them. They will be helping us with a variety of tasks in the run up to the move to the new archives centre, and we’re very grateful for their help. Many archives nowadays rely on the support of enthusiastic volunteers, and we are no exception, although in return we hope to provide interesting and varied work and to involve people in the range of activities going on in a modern archives centre. All of our current volunteers were attending a Volunteer Induction Day, where we talked about how their work fitted in to our strategy map, introduced the Volunteer handbook and passed on some basic preservation skills using conservation equipment. Total folders cleaned by the end of Monday = 70! A fantastic achievement that makes a real contribution to the work the staff undertake in the archive every day. We’ve worked hard to make sure that our volunteer opportunities fit in with ARA’s (Archives and Records Association – the professional body for archivists) policy on volunteering, and if you’re interested in finding out more about a career in Archives, the guidance on this page should be your first stop! Lindsay Ince on Catalogues a plenty at Heritage Quay! David Browning on Catalogues a plenty at Heritage Quay!